I’m too tired to write much tonight. Suffice it to say that the Cousins and Candlesticks tour had its genealogical high spots…. We visited the tomb of our great-grandmother, Ettel Gruber, in the Jewish Cemetery in Radauti (where I have been three times before since 1978). Thanks to the good efforts (and contacts) of Doru Losneanu, Mr. Dorian Frankel helped us go through records at the Radauti Town Hall. We found the marriage registry for the parents of both our Grandfather, Ephraim/Frank (that is, Anschel Gruber, widower, aged 34 and Ettel Lecker, single, aged 19) in 1880 and our grandmother, Rebecca Rosenberg (David Rosenberg and Celia Halpern) in 1902. This also gave us the address in the village of Vicovu de Sus where, it seems, Anschel Gruber lived at the time of his marriage. We drove to Vicovu de Sus, about 1/2 an hour’s drive, up at the border with Ukraine — there is a border crossing there for local people. It’s a village strung out for seeming miles along one road… with the help of a couple of very nice local policemen, we found what we believe was the house, an old wooden farmstead, set down a dirt track, amid cornfields, well of the road (apparently an elderly woman, as well as a barking dog, lives there — and she does have a satellite dish…). The town also has a fine synagogue, built in 1856. It has been restored — with major funding from various Japanese sources — and is now used as a concert hall and cultural center. There didn’t seem to be any signage, however, denoting it either as a synagogue or as a culture center/concert hall… Work was going on restoring the outer walls, and it didn’t look open. A young woman, however, was sitting on a park bench across the street (near a Holocaust memorial located in in the park) and she came across with the key to open up when she saw us trying the door. At Vatra Dornei, we stopped to take a look at the derelict, Moorish-style great synagogue, built in 1902, which looms over the main street of this once-grand old spa town (and source of major brands of mineral water). Years ago I attended a Hanukkah celebration here, when I toured Romania during the festival with the then-chief rabbi, Moses Rosen… The sanctuary was brightly lit and crowded with people in winter coats and fur hats, and a Jewish children’s choir performed. Most of the Jews who lived there have now either died or moved to Israel (or elsewhere). I have no idea what the fate of these once-magnificent building will be….It looks no better but no worse that it was when I saw it 3 years ago; but time will take its toll. What to do with buildings such as this, large, impressive structures that need much work and a fitting, dignified use, was the subject of the Jewish heritage seminar in Bratislava in March, which I reported on at that time. First day of the cousins and candlesticks trip…. 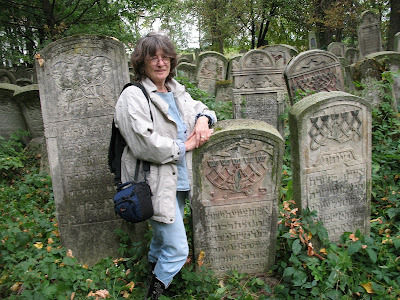 my cousins Hugh Rogovy and Arthur Schankler and Hugh’s son Asher are joining me on my research trip to Radauti, in northern Romania, to work on my (Candle)sticks on Stone project, about the representation of women in Jewish tombstone art. My project isn’t a “roots” project, but Radauti is the town from which our grandparents emigrated to America and where Ettel Gruber, the great-grandmother of Hugh, Arthur and myself, is buried. Hugh, Asher and I picked up Arthur at the Budapest airport this morning, and we drove all day, winding up tonight in Bistrita, in Transylvania (a town known to readers of Dracula…. we are staying tonight in a modern hotel named after a fictional one in the novel). I haven’t been to Romania in three years, so I’m interested in seeing the changes, now that the country is in the EU. There certainly seem to be more roadside hotels, restaurants and advertising, and there has been some work on the roads themselves…. We’ve eaten wonderfully today. Ciorba at a gas station cafe, served with cups full of sour cream and hot pickled pepper… tonight in Bistrita, everything from mamaliga with Branza cheese to stuffed cabbage (sarmale) at a terrific traditional restaurant, Crama Veche…. On to Radauti (and the ancestral village, Vicovu de Sus) in the morning.